This level has medium difficulty. For this level try to play more from top part of the table and make special candy as you get the chance. 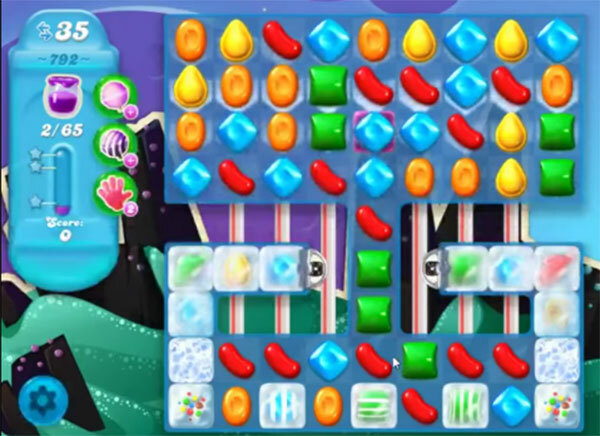 Combine them with each other to break more blockers or use striped candy with other special candy to break the blockers that are in bottom part of the table. De werkelijkheid is moeilijker dan de video, daar gaat het van zelf! Lastig level. Medium difficulty my a$$. Tips are just obvious things you should have learned by game 10. Moving right along, how are you supposed to win when the fish are working against you? I had one square left and I made three frosted fish. Not one of them even went near my last square. I don’t get it and I wish someone would explain to he how you figure out what any of the flashing, blinking, boxes of numbers and other crap on the screen mean? Are people supposed to be born knowing how to play this game? I have searched and never found any kind of help in understanding all the crap flyin, zinging, flashing et al. I think I have figured out that you will get harder boards if you don’t spend money but sometimes if you use some of your bonuses or whatever you call all that stuff that hardly ever helps, you might get a break. Never gone over 3-4 days without advancing so frustrating, yes, but free so whatever.